Added information in the 2017 edition of NFPA 921 helps you work more accurately to investigate fire origin and cause. If your job involves investigating fires and explosions, then you need the latest NFPA 921: Guide For Fire & Explosion Investigations. Revised and updated for the 2017 edition, this document is the premier source for rendering scientific based opinions on origin and cause investigations along with incident responsibility. NFPA 921 describes in detail the scientific method to apply in fire and explosion investigations. Public and private professionals have long seen NFPA 921 as a valuable resource in the field and in training. It's also becoming increasingly relevant in U.S. federal and state courts, where the document is used to evaluate the reliability of fire investigations in both civil and criminal trials. 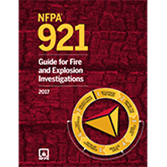 Recently NFPA 921 became a recommended guide for fire investigation by the Organization of Scientific Area Committees (OSAC) -- a collaborative body of more than 600 forensic science practitioners and experts who recommend forensic science consensus standards and guidelines. Complying with NFPA 921 can support a fire investigator's opinion; not complying can result in serious challenges to your testimony. Changes in the 2017 edition reflect user needs in a challenging field. Chapter 1 was revised to support Fire Marshal and Fire service organizations in the completion of reports from the National Fire Incident Report System (NFIRS). These reports were being misapplied and compared to Fire Investigation Reports during courtroom testimony. The committee added to scope of NFPA 921 to distinguish an NFIRS Report from a Fire Investigation Report and identified one should not be used in lieu of the other, especially when NFIRS are outside the scope of NFPA 921. Chapter 8, Fire Protection Systems, was renamed Active Fire Protection Systems since passive systems are addressed in Chapter 7, Building Systems. New images and illustrations were added based on NFPA 72®: National Fire Alarm and Signaling Code® and the Fire Protection Handbook. Updated Chapter 16, Documentation reflects technology breakthroughs in the areas of digital photography and 3D scanning. Chapter 18, Origin includes the concept of origin matrix addressing the impact of ventilation on origin determination. Featuring additional new full-color images, especially for Fire Protection Images. Interested in other editions of NFPA 921? Use the drop down menu above to select the edition year you need. 2.4 References for Extracts in Advisory Sections. 4.1 Nature of Fire Investigations. 4.3 Relating Fire Investigation to the Scientific Method. 4.4 Basic Method of a Fire Investigation. 5.6 Fuel Load, Fuel Packages, and Properties of Flames. 5.9 Fire Spread in a Compartment. 5.11 Fire Spread Between Compartments. 5.12 Paths of Smoke Spread in Buildings. 7.2 Features of Design, Construction, and Structural Elements in Evaluating Fire Development. 7.6 Impact of Passive Fire Protection Systems on Investigation. 7.7 Design and Installation Parameters of the System. 7.8 Documentation and Data Collection. 8.2 Documentation of Fire Protection Systems. 8.4 Water-Based Fire Suppression Systems. 8.5 Non-Water-Based Fire Suppression Systems. 9.9 Ignition by Electrical Energy. 9.10 Interpreting Damage to Electrical Systems. 9.11 Identification of Arc Melting of Electrical Conductors. 10.5 Common Fuel Gas System Components. 10.6 Common Piping in Buildings. 10.7 Common Appliance and Equipment Requirements. 10.8 Common Fuel Gas Utilization Equipment. 10.9 Investigating Fuel Gas Systems Incidents. 11.3 General Considerations of Human Responses to Fires. 11.4 Factors Related to Fire Initiation. 11.7 Human Factors Related to Fire Spread. 11.8 Recognition and Response to Fires. 12.3 Legal Considerations During the Investigation. 13.2 General Fire Scene Safety. 13.6 Personal Protective Equipment (PPE). 13.9 Safety in Off-Scene Investigation Activities. 14.5 Governmental Sources of Information. 14.6 Private Sources of Information. 15.3 Organizing the Investigation Functions. 15.5 Specialized Personnel and Technical Consultants. 17.3 Preservation of the Fire Scene and Physical Evidence. 17.4 Contamination of Physical Evidence. 17.7 Identification of Physical Evidence. 17.8 Transportation and Storage of Physical Evidence. 17.9 Chain of Custody of Physical Evidence. 17.10 Examination and Testing of Physical Evidence. 18.3 Data Collection for Origin Determination. 18.5 Developing an Origin Hypothesis. 18.6 Testing of Origin Hypotheses. 18.7 Selecting the Final Hypothesis. 19.3 Data Collection for Fire Cause Determination. 19.5 Developing a Cause Hypothesis. 19.6 Testing the Cause Hypothesis. 19.7 Selecting the Final Hypothesis. 20.1 Classification of the Cause. 21.2 The Cause of the Fire or Explosion. 21.3 The Cause of Damage to Property Resulting from the Incident. 21.4 The Cause of Bodily Injury or Loss of Life. 22.6 Data Required for Modeling and Testing. 23.3 Characterization of Explosion Damage. 23.5 Factors Controlling Explosion Effects. 23.11 Outdoor Vapor Cloud Explosions. 23.13 Investigation of Explosive Incidents. 23.14 Investigating the Explosion Scene. 23.18 Analyze to Establish Cause. 24.3 Potential Indicators Not Directly Related to Combustion. 25.2 Mechanisms of Death and Injury. 25.3 Consumption of the Body by Fire. 25.5 Investigating Fire Scenes with Fatalities. 25.6 Investigating Fire Scenes with Injuries. 25.7 Explosion Deaths and Injuries. 25.8 Post Scene Investigation of Injuries. 25.9 Fire Death Pathological and Toxicological Examination. 26.3 Origin Analysis Involving Appliances. 26.4 Cause Analysis Involving Appliances. 27.3 Fuels in Vehicle Fires. 27.5 System Identification and Function. 27.7 Motor Vehicle Fire Scenes. 27.10 Special Considerations for Incendiary Vehicle Fires. 27.15 Agricultural Equipment and Implements Introduction. 29.2 Basic Information and Documents. 29.3 Communications Among Interested Parties. 29.5 Management of the Investigation. 29.8 Site and Scene Safety. 30.2 Powerboat and Sailboat Terminology. 30.4 System Identification and Function. 30.9 Documenting Boat Fire Scenes. NFPA 921 is the field's leading reference for safe and systematic fire and explosion investigations. Whether you're investigating a residential fire or a complex industrial disaster, the most important resource for fire investigators, litigators, and insurance professionals is NFPA 921: Guide for Fire and Explosion Investigations. This trusted Guide addresses every stage of a very complex process -- from basic fire investigation methodology to collecting evidence to failure analysis. Each edition is updated based on the most recent court cases, scientific data, and trends, to help you offer expert testimony and render opinions that stand up to scrutiny. The 2014 edition of NFPA 921: Guide for Fire and Explosion Investigations marks the first time the Guide includes color images. This enhancement allows us to communicate and demonstrate key concepts and examples more clearly. As a result, readers will gain a better understanding of the principles of fire and explosion investigation. The 2011 edition of NFPA 921: Guide for Fire and Explosion Investigations has a rewritten Chapter 18 on cause that helps ensure fire investigators use scientific methodology when developing hypotheses, avoiding errors and Daubert challenges. An all-new section outlines the report review process in fire investigation and discusses peer vs. technical review. A critical update concerning explosion investigations features new illustrations and photos. Numerous other changes help users respond to growing and emerging fire problems, such as vehicle fires involving electric/hybrids and their potential for high voltage hazards impacting investigators. The 2008 edition of NFPA 921: Guide for Fire and Explosion Investigations clarifies the process investigators should use to identify and recognize fire effects and fire patterns. Other changes present a more comprehensive, systems approach for dealing with complex incidents -- such as those involving fatalities or injuries, fires in high-rises or building complexes, and fires or explosions in industrial plants or commercial properties. A new chapter on marine fire investigations provides first-time coverage of fire and explosion investigations involving recreational boats, including safety issues due to environmental contaminants.